Wildcat Day at the Capitol Supporters Lobby Legislation for School Funding and Dr. Mary McLeod Bethune Statue in Washington, D.C.
Tallahassee, Fla. – March 21, 2016 – With the height of increasing college tuition rates, Bethune-Cookman University is headed to Florida’s capitol for Wildcat Day at the Capitol (WDAC) to lobby for additional funding that will aid current and prospective students during their matriculation at B-CU. Hundreds of students, faculty, staff and alumni will board buses on Wednesday, March 22nd at 5:30 a.m. and head to Tallahassee to join President Jackson and other university leaders. The WDAC participants will meet with lawmakers to discuss their concerns, share the successes of B-CU, lobby for funding and highlight the importance of Dr. Mary McLeod Bethune’s statue placement in Washington, D.C. This past year, a statue of Dr. Mary McLeod Bethune was unanimously nominated to replace Confederate Army General Edmund Kirby Smith at the U.S. Capitol. During Wildcat Day at the Capitol, B-CU is looking for support for Grants and Aid, Bridge to Success, Entrepreneurship and Economic Development, Project CHILD, Library Resources, Black Male Explorers, Florida Resident Access Grant (FRAG), Dr. Mary McLeod Bethune in the National Statuary Hall, Petrock College of Health Sciences, and the School of Legal Studies and Social Justice. WDAC participants will be addressed by President Jackson and the B-CU delegation in the House Chambers at 10:00 a.m. 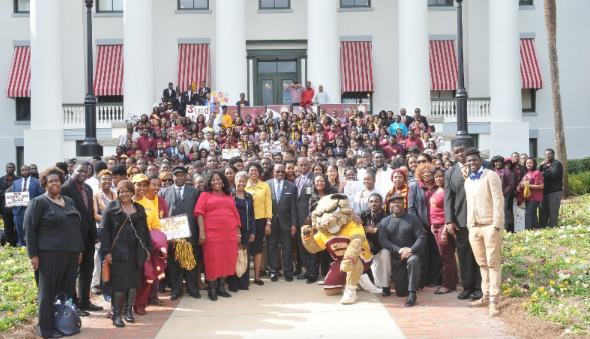 They will follow with a rally in the lobby of the Senate Chambers at 11:30 a.m.
For more information and media inquiries for Wildcat Day at the Capitol, please contact Keisha Boyd (386) 481-2991 or boydk@cookman.edu.